Another day, another surprise album release. 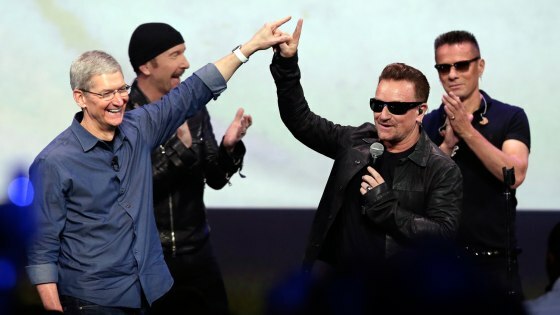 On Tuesday, U2 became a member of the growing group of artists who have pulled a Beyoncé, announcing the release of their new album “Songs of Innocence” — wait for it — at the iPhone 6 press conference. Oh, and they gave it away for free to every iTunes user on Earth. In practice, however, the whole ordeal just comes off as hokey. Their manager must have loved the idea of a surprise release on paper. But no matter how much publicity it receives, the bottom line is that the most white bread band around revealed their equally white bread new album during the annual “Boring Rich White Men of America” conference. As is to be expected, there is a catch to the sweet deal Apple gave Bono and friends: “Songs of Innocence” is only available on iTunes, which isn’t likely to change until October 15, when it stops being free. Again, this wouldn’t be a problem if the band had the status enjoyed by Queen Bey, Justin Timberlake, Taylor Swift and the like. But it’s U2. And even if it’s free, I know I’d want to check it out on Spotify first before going through the ordeal of downloading it. Is it so hard to accommodate our generation’s extremely selfish and lazy media consumption? On top of all of this, the surprise release thing just seems stale. Maybe it’s just U2’s general blandness talking, but the novelty is definitely wearing off. The first time, it was a revelation. The subsequent few were to be expected. And now the concept is just plain gimmicky. Maybe it will work out for U2. Maybe “Songs of Innocence” will be a decent hit. But seeing the way the band has handled this release so far, they may as well have just publicized it normally. The point of a surprise album is to release it swiftly and silently. At least they got the first part right.